A HUGE saltwater crocodile, back in Flamingo Bay! Bud n' Mary's in the early 21st century! An Osprey snags the head of a yellowtail from the party boat! Hey! Nick Stanczyk with a deep drop surprise. A barrel fish! Guide Perry Scuderi and an oilfish. 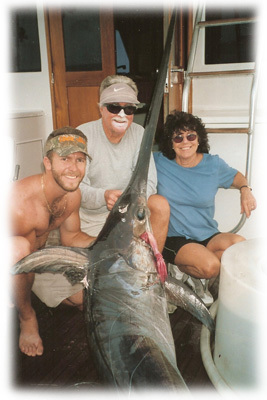 Another strange deepwater specimen caught while fishing for swordfish! A huge tripletail with Richard Stanczyk and Jim Coughlin. One of my favorite eating fish! Kenny Spaulding & Kenny Cox with a good... seatrout! Weakfish! Whatever! A Sheeps head! Good catch! A friendly green turtle. We see lots of 'em out on the reef and in the backcountry! Taylor Walsh & Mikey Mason, collectively known as MAYLOR!!! Some kids with some nice tails! Hey Micah... it's... the manatee! Found floating way out in the deep ocean... an oar fish almost 10 feet long!